Today, there are many different kinds of medical professionals available whose job it is to keep us healthy for as long as possible. One of them is a dentist. A dentist is a medical professional that the people see on average of twice a year for general teeth cleaning as a preventative measure against gum disease. What do dentists do? Here are some questions and answers on what dentists do and other facts about the professionals. He or she is a medical provider who diagnoses, treats and manages the comprehensive health of a person’s teeth and gums and the health of the teeth and gums in relation to a person’s overall health. They work with children, teenagers, adults, and seniors. He or she will make it a goal to ensure that a patient is taking care of his or her teeth and gums properly by giving advice and counsel on how to prevent problems associated with teeth and gums. Although a dentist can do routine cleanings every six months, more and more the bi-annual routine cleanings are left to a dental hygienist who works in the dentist’s office. 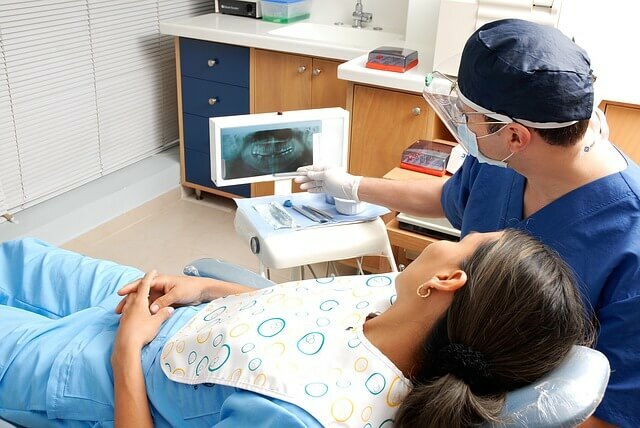 Therefore, in many cases, a dentist is focused on more advanced work such as caring for the gums, root canals, crowns, veneers, fillings, bridges, teeth extractions, examining x-rays, and more. Because they are medical doctors, they can write prescriptions for medications, such as antibiotics. As with most medical professionals with advanced degrees, the earnings for a dentist can be high. In 2017, the median pay for a dentist was a little over $158,000 per year, which breaks down to approximately $76.00 an hour. A dentist must complete a four-year bachelor’s degree program. After he or she receives an undergraduate degree, he or she must attend a four-year professional dental school program. The Dental Aptitude Test or DAT must be passed to attend dental school. At most schools, observation of a general dentist is required of at least 100 hours during the four-year program. Upon completing the program, he or she will obtain either a DDS, which is a Doctor of Dental Surgery or a DMD, which is a Doctor of Medical Dentistry. The two are equivalent, and which one is given depends on the school. After dental school, a licensing examination must be passed. After the basic training of becoming a dentist, the professional may choose to undertake additional training to specialize in an area. Examples of these specialties include Orthodontics, Endodontics, Oral Surgery, and more. When a patient visits a dentist office, they will find a dental chair, a tray of equipment, and other objects. Dentists wear masks, gloves and sometimes safety glasses to protect themselves but to also protect the patient. They use a wide variety of tools including drills, mouth mirrors, forceps, probes, brushes, scalpels, etc. Large machines include x-ray machines, digital scanners, lasers, etc. A dentist can work in a variety of environments. Some work in clinics as well as nationwide chains. Others have opened their own practices either working alone or with a small staff. Some dentists work with other dentists in a partnership or work for more established dentists in an associate compacity. Typically, a dentist will work four to five days a week, including some weekends and some evenings. For dentists who have been working for many years, they are in a better position to reduce their hours than those who are just starting out. A dentist can work in his or her profession past the typical retirement age of 65. A dentist is a valuable part of society and a necessary medical professional. A person’s dental health is not only important for the health of their teeth and gums but in their overall health. Failure to get professional dental care can result in untreated cavities, gum disease, pain, loss of teeth function, missing teeth, infections and serious illnesses that can lead to hospitalization and sometimes death. Serious dental disease has been linked to conditions such as diabetes, heart disease, kidney disease, cancer, and more. Even if you take proper care of your teeth and gums, it is recommended to get a dental checkup at least once every six months in order to make sure that any problems are caught right at the beginning by the dentist. In case you have gum disease or any other dental issues, you should get more frequent dental checks. Your dentist is in the best position to decide how often you should get your teeth checked based on your oral health. 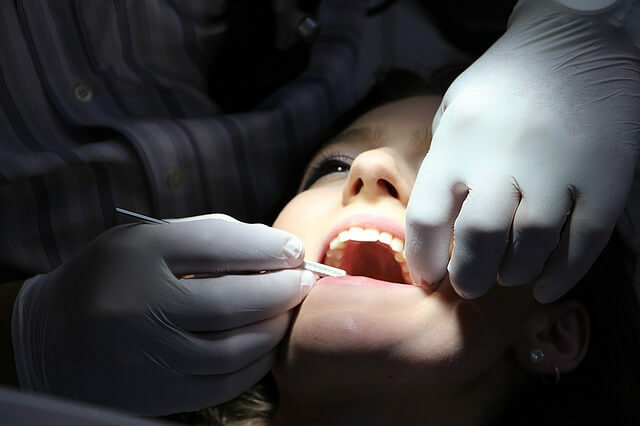 During a routine dental checkup, a dentist, dental hygienist or referral practice Jacksonville Dentist in 32223 – Farnham Dentistry Family Practice will do a professional cleaning of your teeth and gums, perform an oral exam and if needed, may also do x-rays. They will also ask about your past dental issues, drug reactions, use of medication, allergies as well as any other chronic diseases. As far as the cleaning process is concerned, the dentist will use a small metal instrument to get rid of the tartar that lies above as well as below your gum line. In some cases, a vibrating device may also be used to loosen up plaque which is then rinsed away with the help of a stream of water. Once the tartar and plaque have been cleared up, the teeth are polished with the help of a light abrasive paste and this process is then finished up with flossing. This cleaning process makes it more difficult for plaque to accumulate on your teeth. Once the cleaning has been done, an oral exam will be performed to check for any signs of tooth decay. This is usually done with the help of a metal probe along with a small mirror bent at an angle. During this examination, your dentist will check for gum redness, swelling as well as other important things. Any deep pockets, redness or swelling are early signs of gum disease. During the examination, a dentist is also likely to check whether your upper and lower teeth come together properly. This is to look for any evidence of tooth grinding or other such issues. The dentist will also examine your lymph glands, neck as well as soft tissues of your mouth to check for signs of any kind of infection as well as oral cancer. In case you’re not sure whether you are checked for oral cancer as part of the dental exam, you may clarify with your dentist and ask him or her to perform this check at each dental exam. In some cases, dental x-ray pictures may also be required to check any potential issues below the surface of your mouth. The x-rays are done with the help of a specially designed plastic. The dental x-ray shows the visible part of your teeth along with the roots of your teeth below the gum line and your jawline. It allows the dentist to see everything happening in your mouth. Once the cleaning and dental examination is complete, your dentist will tell you everything going on in your mouth and will also offer you advice on any next steps you might need to take. They may also schedule another dental appointment in the future. It is important to take this advice seriously and follow the recommended tips to take proper care of your teeth and gums. A regular dental check-up at six-month intervals allows your dentist to make sure that you do not develop any major dental problems. If you leave dental problems unattended, it is only going to make it more difficult for your dentist to treat them in the future. Therefore, it is best to treat the dental issues as early as possible. As far as the frequency of dental checkups is concerned, it will be decided by your dentist. In some cases, it can be as short as three months or it can be as long as two years. Generally, people with good oral health need to get a dental checkup every two years. Overall, it is important to take care of your gums and teeth between your regular dental checkups. You should brush and floss regularly in order to keep the plaque away from your teeth. It is recommended to brush at least two times each day using a toothpaste containing fluoride. You should also floss your teeth at least once each day and also use mouthwash to control plaque-causing bacteria. Believe is or not, but our website hosting went down again. We have switched hosting and are back. Hopefully this time to stay! We’re looking to see if we can restore this content from the original website. If we’re able to, we’re going to post it here. If not, I’m not sure. Anyways, we hope to have the original hunt back up even if it’s just for reference.